An excellent introduction to Harriet Tubman and the role that faith played in her life. 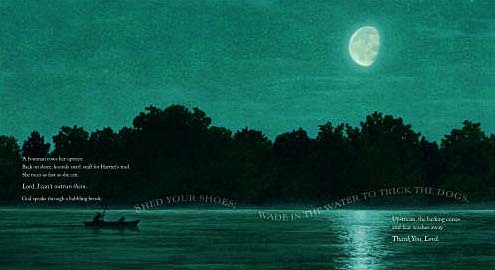 Lyrical text and powerful illustrations depict Tubman prior to escape, during the dangerous journey, and afterward as she helped others find freedom as well. 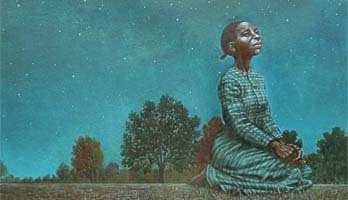 Throughout the book, Tubman prays for guidance and help, receiving confirmation from God that He desires for her to be free. 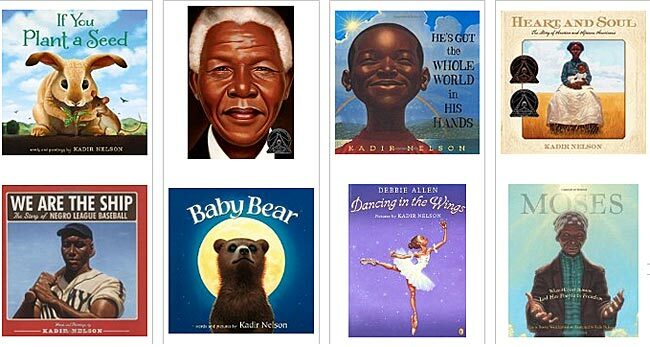 This is an inspiration title to read anytime, but would be especially ideal for units on slavery, American heroes, or during Black History month. This is a very powerful book, with text and illustrations that bring this great woman to life for young children. 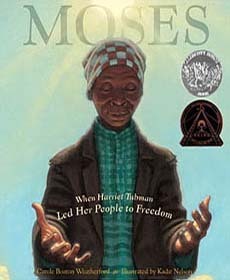 Illustrator Kadir Nelson masterfully captures the many emotions that Tubman must have experienced before and during her dangerous escape (ie: apprehension, fear, determination...) Please note: This book is religious in nature and may not be appropriate for public school use. We recommend that teachers preview this book via Amazon's "Look Inside" feature to determine the appropriateness for your school/community. Here are some representative spreads from inside this great book. At right is one of our favorite illustrations from this book. Absolutely beautiful when viewed in full size (book size)! And the spreads below show Tubman during her escape, praying for guidance (top), fighting off fatigue (middle), and struggling to stay ahead of the men who were chasing after her (bottom). 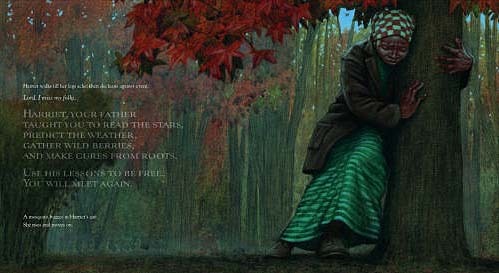 In spreads and throughout the book, Tubman feels comforted and protected by God, conversing with Him in times of despair and receiving guidance from God (printed in capitals) that sustain her as she makes her way north.